According to the United Nations, over 54,400 people have been displaced internally by the conflict in Ukraine. The ongoing turmoil raises the possibility that some Ukrainians will seek refuge in Belarus. President Alyaksandr Lukashenka promised to support any and all Ukrainians in need. However, to date, only 65 Ukrainians have applied for refugee status in Belarus, a small number when compared to the 9,500 Ukrainians seeking official refugee status in Russia. Despite its relative political stability, only about 891 people have obtained official refuge status in Belarus in 2014. In contrast, over 6,000 Belarusians hold refugee status abroad. To date, the Belarusian regime has blithely encouraged its political opponents to leave the country. And so they did, along with a great number of others who left for economic, rather than, political reasons. As a result, Belarus is losing swathes of its politically or economically active citizens, people who are far less able to bring about positive socio-economic changes from abroad. Who Seeks Refugee Status in Belarus? Every year, about 200 people seek refugee status in Belarus. Over the years, most asylum seekers have come from Afghanistan. Since 2013, however, the number of Syrian refugees has increased. In the past, Belarus also hosted refugees from Georgia. Most refugee seekers come from countries involved in warfare or ethnic conflict. The open Russia-Belarus border, on the one hand, and the construction of a common external border around the EU member states, on the other, have contributed to an increase in the number of refugees coming from Asia to the EU. Belarus and other post-Soviet states on the EU border are increasingly becoming home to the EU’s unwanted migrants. When apprehended on the EU border, migrants often apply for refugee status in Belarus in order to avoid prosecution for illegal border crossing. Belarus complies with the international refugee regulations and has acceded to the 1951 Geneva Convention and the 1967 Protocol. While Belarus has no refugee camps, several temporary accommodation centres are available. After seven years living in country, refugees can apply for Belarusian citizenship, provided they know one of the state languages and respect its national legislation. Since 1997, over 3,000 people from 33 countries have applied for refugee status in Belarus. For every refugee approved, there are about 3 denials. The acceptance rate is thus much higher than in many other countries. The international average for granting asylum is a mere 3-7% of all applicants. While on paper all foreigners have the right to seek asylum, the Belarusian authorities reportedly decline asylum requests from Russian citizens. Perhaps one of the most notorious characters sheltered by the Belarusian state is the deposed president of Kyrgyztan, Kurmanbek Bakiev. In 2010, during the upheaval in Kyrgyzstan, Kurmanbek Bakiev’s security forces fired on protesters, killing 40 and wounding 400. Bakiev is accused of committing mass murder back home, yet was welcomed as a guest and friend by the Belarusian President when he arrived at the Minsk airport with four members of his family. By now he has allegedly become a citizen of Belarus. Belarus produces its own share of asylum seekers, even though it is a relatively stable and peaceful affair. Many Belarusians seek protection due to the political situation in Belarus. There are also some cases of LGBT asylum seekers, who seek protection from persecution on the basis of their sexual orientation. And, of course, some people leave for economic reasons but find it more expedient to apply for political asylum than to try to go through other channels. The number of Belarusians seeking asylum has peaked in the first half of the 2000s and been on a steady decline since then. Even so, far more Belarusians are seeking asylum today than, for example, Kyrgyzstanis or Russians, when differences in the size of their respective populations are taken into account. Most Belarusians find asylum in the United States or Germany, two western counties that serve as the key destinations for over two thirds of all asylum seekers from Belarus. Belarusians hold the dubious honour of becoming the first post-Soviet nationals to seek political asylum in the United States. In 1996, two prominent leaders of the democratic opposition – Zianon Pazniak and Sergei Naumchik – applied for asylum there. They said their lives were in danger and criticised the Belarusian government for persecuting the political opposition and controlling the media. Many other prominent Belarusians have obtained asylum abroad since then. For example, in 2011, Belarus Free Theatre founders Natalia Kaliada and Nikolai Khalezin won political asylum in the United Kingdom. The theatre has staged many controversial plays, both in Belarus and abroad, which emphasised important issues such as politically motivated disappearances, human rights violations, or the death penalty in Belarus. In 2012, Andrei Sannikov, who came a distant second in the 2010 presidential election, received political asylum in the UK. When Sannikov’s wife, award-winning journalist Iryna Khalip, was visiting her husband abroad, the Belarusian authorities reportedly pressured her to permanently leave the country. To this day, she lives in Belarus. These are just few well-known cases, but each year a large number of Belarusian political activists seek political asylum abroad. The Belarusian government does not prevent them from leaving, as they cause far less trouble abroad than they do at home. This is why Iryna Khalip may have been pressured to follow her husband into exile. President Lukashenka has on a number of occasions stated that Belarusian activists can easily leave into exile if they choose to do so. While in the short term this approach may save activists from persecution, in the long run encouraging political activists to leave will weaken civil society, independent media, and the political opposition in Belarus. Whether there are any benefits to Belarus when its citizens seek political asylum abroad remains to be seen. So far, the political activists living in asylum abroad have spent too much energy warring with each other. Belarusian communities in exile remain divided as activists compete for victimhood status and fight over invitations from Western organisations. To promote their own names, they often accuse each other of making compromises or selling out to the regime. In the end, the regime can successfully play off its opponents against each other even from far away. Ironically, the atmosphere that pervades the Belarusian political communities in the democratic West at times resembles the atmosphere of mutual distrust and accusations that were so pervasive in the Soviet Union. European institutions face problems when working with this kinds of conditions. They cannot engage people who are in prison in Belarus and face diminishing returns when engaging exclusively with political refugees who can no longer travel to Belarus. 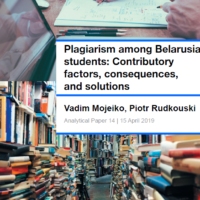 Belarusians who remain at home have a significantly better ahcen of making a difference, but unfortunately they are often accused of working for the regime or making compromises. Over the past week, state TV Channel 1 covered Alexander Lukashenka’s visits to state enterprises in the regional cities of Salihorsk and Barysau. In their coverage, state TV journalists reported on the excellent personal connection the head of state had with ordinary Belarusians. They presented him as a politician who has always remained close to peoples’ problems and is keen to discuss of any controversial issues at any given moment. Coverage also touched upon recent developments in Ukraine and the growing number of refugees that the conflict in the east is creating. According to their coverage, Ukraine may go bankrupt in two years time. In this edition of our Belarus State TV digest we summarise these and other stories grabbing the headlines in Belarus. A Cease-fire in Donetsk and Lugansk. According to Russia, the recent death of two of its reporters was a violation of the cease-fire in Ukraine. State-run Channel 1 showed Sergey Naryshkin, a speaker of the Russian Duma, demanding not only a genuine investigation of the tragic events, but that those responsible should be brought to justice for the death of the reporters. Still, the overall number of casualties from the anti-terrorist campaign remains unclear. Although the Ukrainian Ministry of Defence speaks about 147 soldiers died during the action, Jani Megazzeni from the United Nations stated that since the beginning of the anti-terrorist campaign, 386 people had lost their lives in Ukraine due to the conflict. Ukrainian Economy Barely Hanging On? Standard & Poor’s, the credit rating agency, gave a pessimistic forecast for Kyiv for the coming years. The country may even officially become bankrupt. Another problem facing the country is the growing number of refugees who are fleeing eastern Ukraine and seeking to settle elsewhere. State TV also commented on a recent remark made by Anders Fog Rasmussen, the head of NATO, on the involvement of Russian special services (the FSB) in providing financial support to European ecological organisations which advocate against the extraction of shale gas. Greenpeace, the world's largest environmental activist organisation, reacted with irony to these insinuations, according to the report. Lukashenka Mingles with Ordinary Belarusians. A dialogue with simple workers remained an inherent part of any visit of the Belarusian leader to the state company, states the reporter. This time the head of state visited the Belaruskali company in Salihorsk. He spoke with the workers, a majority of whom were upset by the scandal that erupted between Russia and Belarus that involved Belaruskali. Lukashenka had previously come to the company back during his presidential campaigns in the 1990s. “That was a difficult meeting, I can recall it until now. And then I had promised you that if I were to become president, though I did not believe that I could have become the president then (…), I reassured you that I would have never sell off the interests of the miners”, Lukashenka stated. The Belarusian leader reassured the crowd that he “would not forgive theft and appeasement” from the company's management. In the coverage of the meeting, the video carefully depicts the Belarusian audience closely paying to attention to every word Lukashenka spoke. Several times throughout the report, the narrating journalist points out how strong the line of direct communication is between the head of state and regular Belarusians. Belaruskali: Of Strategic Importance to the Belarusian Economy. “The potash industry is always receives special attention from the President", states the narrating reporter. He pointed out that Belaruskali had overcome last year's crisis and remained a worldwide leader in potash production. The problems that the state company faced were due to the jealousy of other companies. What then propped up Belaruskali during the crisis then was not only the state, but also “new technologies, and the great reputation of the company". Lukashenka reassured his audience that everything associated with the company's future is seen as part of Belarus' national interests. During the meeting he demonstrated his interest in all of the technology used for mining, state TV boasts. The Authorities Once More Focusing on Ordinary Belarusians. The Belarusian head of state also visited another state enterprise, this time in Barysau. The meeting was broadly covered, and once more pointed out the excellent level of communication that the Belarusian leader and ordinary Belarusians enjoyed. 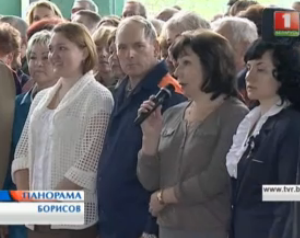 Workers asked Lukashenka a few questions, including a few about Ukraine and changes in the pension system. Throughout the meeting the Belarusian leader was joking around, but drew himself back whenever a topic demanded a more serious demeanour. People appeared be happy to hear him share his thoughts and seemed satisfied with his responses. The head of state also mentioned that his priority remained maintaining a society where “a woman can safely go for a walk with her baby in a stroller”, an oft repeated phrase. Work for Ukrainian refugees? – When posed a question by a member of the audience about the possibility of employing Ukrainian refugees, Lukashenka stated “we should not close the doors on them”. In his opinion Belarus should help the refugees, particularly because many of them have Belarusian roots. “We are ready to let them in, but in an organised manner. The country has a workforce deficit”, he asserted, alluding to the possibility of having Ukrainians come to work in Belarus. Raising the Pension Age? – Another member of the audience asked what was to become of the pension age. “I think it will be raised”, he replied. In his words, Belarus is the only country in the region left that has not changed its pension system. Even Russia has already been working on this issue. The head of state explained that raising the age is due to Belarus' negative demographic tendencies. Belarusian women should give birth to more children, say at least three in a family. This, he said, would resolve the demographic problem and the issues facing any potential state pension age reform. Belarusian Pensioners to Remain the Youngest in the World. The Belarusian Minister of Labour and Social Protection, Marjana Ščotkina, assured Belarusians that it would not increase the state pension age. The report goes on to state, “as the minister noted, all of the necessary conditions have been set up for a person to stay interested continuing on with their professional activity after they have reached retirement age”. “Regardless of the difficulties this year, the major financial document of the state (budget) has maintained its social orientation”, she added. Checking in with the State Committee for Forensic Investigations. Andrej Švied, Chairman of the State Committee for Forensic Investigations, answered dozens of questions from ordinary Belarusians. Although the Belarusian leader established the Committee only a year ago, it has already brought several about benefits to the state. This benefits include 50bn BYR in savings, but the utilisation of more advanced techniques for fighting corruption in the country. In the future, a suspected criminal presumed guilty of corruption will have to pay for their own defence, comments the report, a move that would significantly relief stress on the state budget.